One of the key questions we’ve faced since we launched the SEI Initiative on Climate Services this summer is: what are climate services? At SEI, we describe climate services as an emerging field that aims to bridge the gap between climate science, policy and practice. It involves the timely production, tailoring, translation and packaging of information to ensure that people have access to the knowledge that is most relevant to their needs, and can easily interpret and use it. But is this the view held by other actors in this field? At the Marrakech Climate Conference, we hosted a side-event with a diverse panel of climate information users, providers and intermediatries to explore the question of what climate services are – and, more important, what works well and what key challenges still need to be addressed. Aaron Atteridge – Research Fellow, SEI (facilitator). Sukaina Bharwani – Research Fellow, SEI (organizer and panelist). Sukaina is leader of SEI's new initiative on climate services. Richard Jones – Science Fellow at the UK Met Office. Richard manages work on generating and applying regional climate information and modelling systems with a focus on international development. Katisucia Fara – Advisor Climate Services, Climate & Disaster Risk Reduction Programmes Division, World Food Programme. Katisucia has extensive practitionary experience, including working with pastoralists on short-term decision-making in local contexts. Graham Clarkson – Postdoctoral Research Fellow at the Walker Institute at the University of Reading. 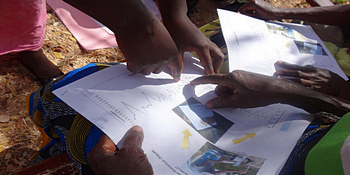 Graham developed a participatory tool (PICSA) used to translate climate information and engage farmers with it. This tool has been widely used and applied by practitioners and organisations, including the World Food Programme. Amy Barthorpe – Head of business at WeFarm. WeFarm is a free peer-to-peer service that enables farmers to share information via SMS, without the internet and without having to leave their farm. Farmers can ask questions on farming and receive crowd-sourced answers from other farmers around the world in minutes (Kenya and Peru). Xolisa Ngwadla – CSIR, South Africa COP22 delegation member and national level user of climate services. Amy Barthorpe of WeFarm introduced us to Victor, a tea farmer in Kenya who had been struggling with pests on his crops. Through WeFarm, an SMS-based social network for smallholder farmers, he connected with Doris, a farmer from Uganda who knew how to handle those pests. Since its launch in 2015, WeFarm has facilitated 15 million such exchanges, connecting more than 105,000 farmers across Uganda, Kenya and Peru. Katiuscia Fara, of the World Food Programme (WFP), told us about finding ways to reach women who might not have access to radio broadcasts, because even if they have a radio at home, it is typically the men who choose what to listen to. WFP created downloadable programmes for women to listen to at their own leisure, alone or in groups. Barthorpe and Fara were among several experts who shared insights from their own experience providing, brokering or using climate services. WeFarm, for example, was developed as a way to reach farmers in isolated rural areas, with no internet and limited access to extension services to help them cope with climate change impacts and other challenges. But not all users of climate information have access to mobile phones or are literate. To serve them well, we need different ways and formats to share information. Some organizations have addressed this through the use of weather bulletin boards and climate information centres. Others have leveraged existing mechanisms for informal information exchange, such as social networks and cultural and religious institutions. What is a climate service? Despite definitions by key actors driving this agenda (e.g. the World Meteorological Organization, the Global Framework for Climate Services and the European Roadmap for Climate Services), it appears that a huge breadth of activity is being labelled as “climate services”. This makes it very difficult to critically evaluate how effective such efforts are. Further work to define criteria for what is and what isn’t a climate service is needed to be able to measure effectiveness and improve the design of such services. Richard Jones, of the UK Met Office, shared insights from the agency's experience developing climate services. More research on methods and processes for understanding user needs is needed. Although providers are taking a more bottom-up approach, climate services remain supply-driven. In practice, there are still limited tried and tested methods and opportunities to explore what decision-makers actually need and importantly, how to deliver this at scale. Climate services need to be tailored to users’ needs and cultural context – which might mean, as with the WFP’s radio programming, differentiating between services for men and women. In addition, different users need information at the different times and scales relevant to their decision context: spatially, from local to national to regional, and temporally, from daily to seasonal to multi-decadal. Effective flows of information facilitated by intermediaries between providers and users of climate information are needed. This can help to address the bottleneck that is a barrier to designing, developing and implementing an effective climate service. Providers of climate services, and intermediaries or brokers, need to develop their own knowledge and skills. They need to master good techniques to elicit information and understand user needs, as well as to use, interpret and apply climate information. Providers such as national hydrological and meteorological services increasingly have to take on the role of intermediary with limited resources and training. Training is just as critical for intermediaries and users. For example, the Participatory Integrated Climate Services for Agriculture (PICSA) approach, shared by Graham Clarkson, has now integrated climate services into agricultural extension worker training by default. Graham Clarkson, of the University of Reading, spoke about the role of agricultural extension services in delivering climate services. To ensure climate services can be better designed, implemented and integrated into decision-making processes over the long-term, formal institutional mechanisms are needed. These should be embedded within the decision-making contexts in which the services will be called upon. This may mean the creation of new institutions or bodies. The way in which users obtain, receive and participate in the production of information critically affects their willingness to use it. To enable trust, credibility and ownership of climate services requires a fundamental shift in how information is produced and shared, to ensure it translates from information to knowledge and action. Despite considerable work, monitoring and evaluation of climate services remains limited, as a certain amount of time needs to pass before the impact of climate information uptake on decision-making can be evaluated. However, there are ongoing efforts to explore how effectiveness can be monitored and evaluated. Our efforts to design and develop climate services must not only respond to user needs in different decision contexts, but must also be flexible and responsive to these emerging lessons. Developing user-tailored products and decision-support tools requires a range of interdisciplinary skills, knowledge and partnerships. It also requires strengthening the science-society interface and acknowledging that all knowledge has equal value, which means involving a diverse range of stakeholders: from decision-makers to practitioners, civil society organizations and the private sector. We need innovative collaborations, dialogue and interdisciplinary efforts to better understand what kinds of climate services people need, and to draw insights from practice and keep improving climate services. That is a key aspect of the work we hope to do through our initiative. The SEI Participatory Framework for Climate Services and its community of research and practice will systematize insights from the breadth of work emerging in the climate services sector into a set of online and interactive guidance. Please get in touch if you would like to join our efforts!